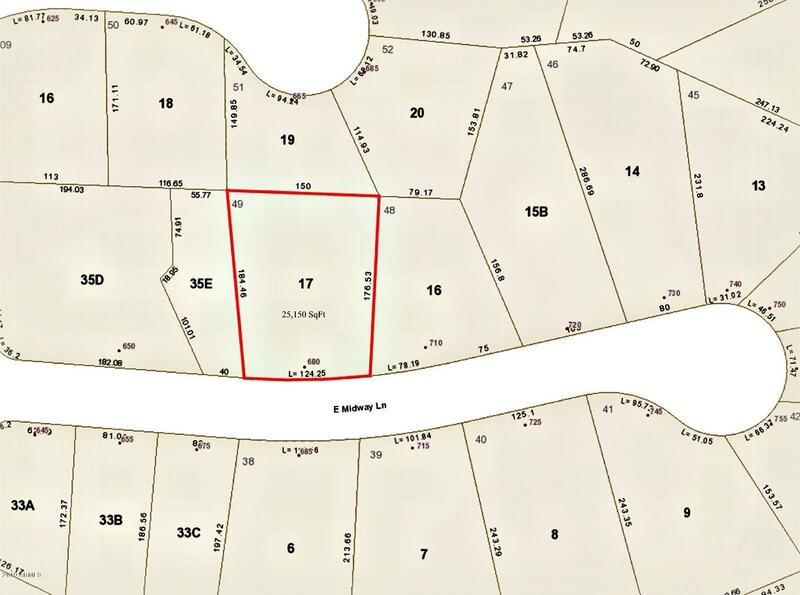 All Munds Park homes currently listed for sale in Munds Park as of 04/24/2019 are shown below. You can change the search criteria at any time by pressing the 'Change Search' button below. If you have any questions or you would like more information about any Munds Park homes for sale or other Munds Park real estate, please contact us and one of our knowledgeable Munds Park REALTORS® would be pleased to assist you. 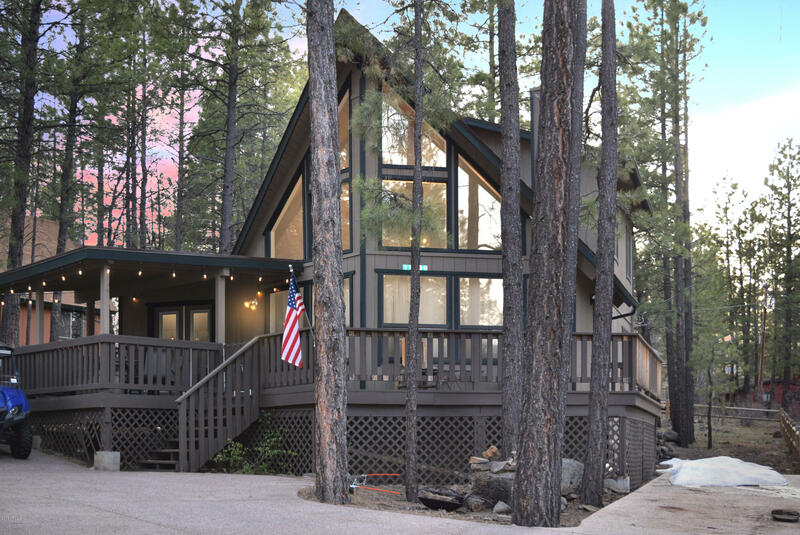 "Gorgeous 2-level 3500 sq ft custom new build full log home in the Ponderosa Pines. Two master suites, great room and gourmet kitchen on ground level. 1382 sq ft 40' deep 4-car garage that opens in front and back. 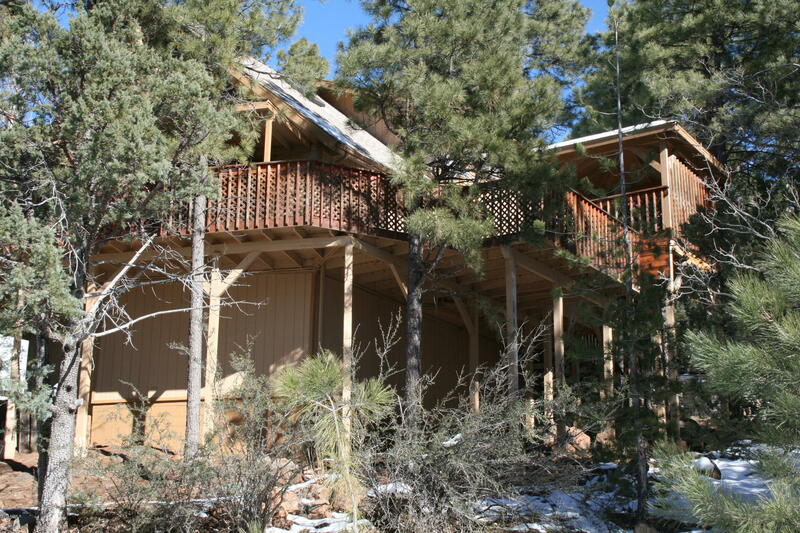 Soaring ceilings, wood beams, log stairs and railing, 2 beds and full bath upstairs. 1900 sq ft of 10' deep wrap-around covered patios. Breathtaking views from every window. Public waste water system, shared well, and power to the sites. Mild winters, Pinewood Country Club and restauran"
"BRAND NEW custom built home in the heart of Munds Park in a small quiet cul-de-sac. This home has a large four car garage, 4 bedrooms, and 4 baths. The master bedroom is located on the main floor with a fireplace, sliding glass doors enter to back patio, his/her walk in closets, and double sinks. The main living area has an open flow concept with a large fireplace and tons of natural light. From the kitchen and dining area you have views of Munds mountain. **Covered front and back decks"
"Magnificent Munds Park home on over an acre/60,984 sqft. 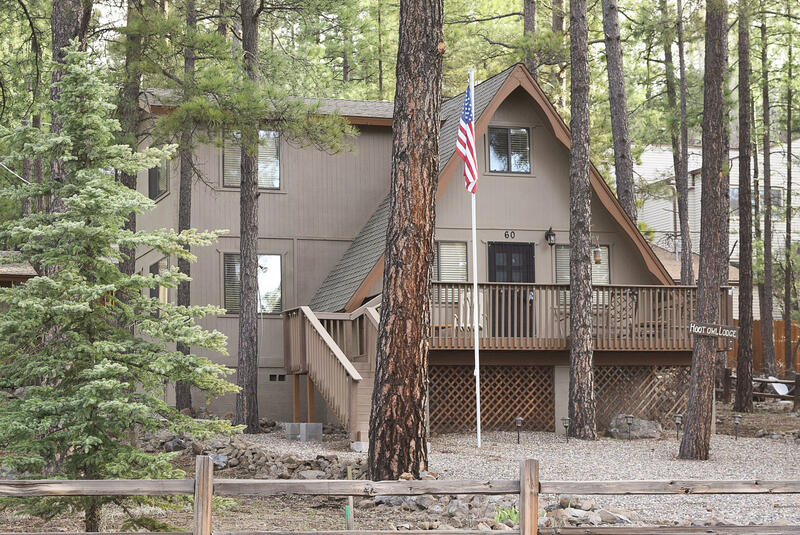 Great Airbnb Rental: Booked solid, situated on a circular drive, steps from Pinewood Country Club Golf Course, Hiking and UTV Trails and just 20 MIN TO Snowbowl Ski Resort. This lovely home has a huge great room with soaring wood ceilings, wood floors and gas fireplace. Spacious master suite on main level with french doors to the Covered Wrap Around Deck for enjoying Volleyball, and BBQ on a cool summer day. 2 A/C, propane furnace system, "
"Beautiful home with 3 large bedrooms and upgraded 2 1/2 baths. Large great room with tongue and groove ceiling and floor to ceiling windows for panoramic view of golf course. Rustic kitchen with knotty hickory cabinets, granite countertops, island with breakfast bar, stainless steel appliances and walk-in pantry. Master bedroom with on-suite bath on main level and 2 bedrooms and loft upstairs. Separate laundry room includes washer and dryer. Knotty alder doors throughout. New tile, lamina"
"Terrific year round home with many extras!! The kitchen is equipped with a new refrigerator &,dishwasher.There is a trash compactor, double sink, pantry, breakfast bar and large dining area. Newer hot water heater and new roof. Living room is bright and sunny and has a large wood burning fireplace. The vaulted ceilings are cedar.Solid wood panel doors throughout. Double car garage and a carport too. 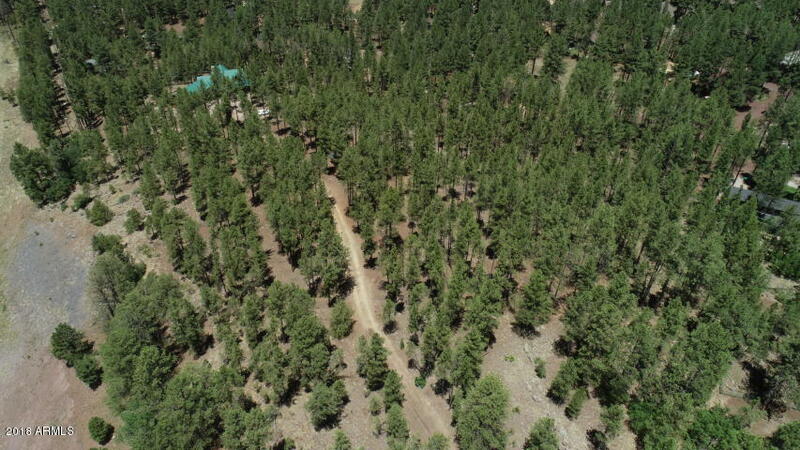 Large 13,330 sq ft lot offers lots of space and privacy. A Master Cooler for those rare hot days "
"FANTASTIC LOG CABIN nestled on a beautiful, heavily treed, landscaped lot. Amenities include 3 bedrooms, 2.25 baths, loft, gorgeous wood burning fireplace, wood flooring, finished basement, covered decks front & back, metal roof, garage and room for an RV. 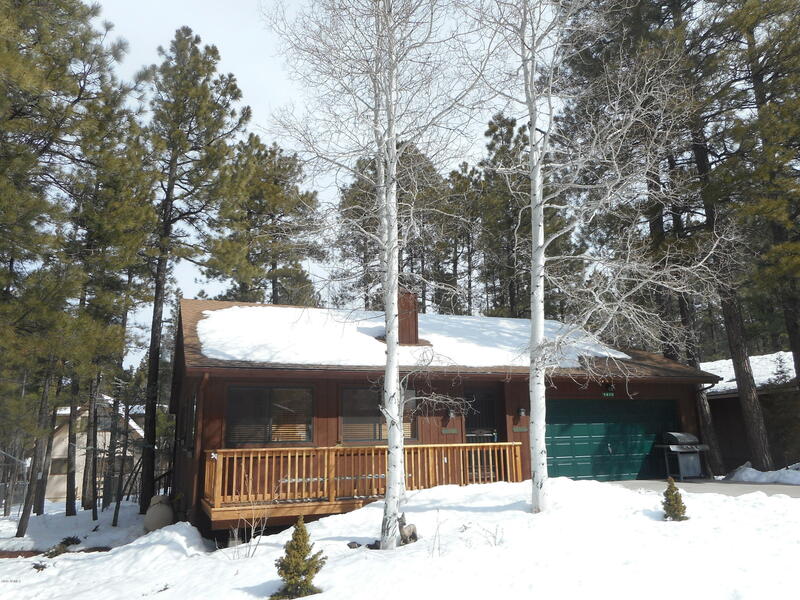 Cabin is warm, inviting and in great condition." 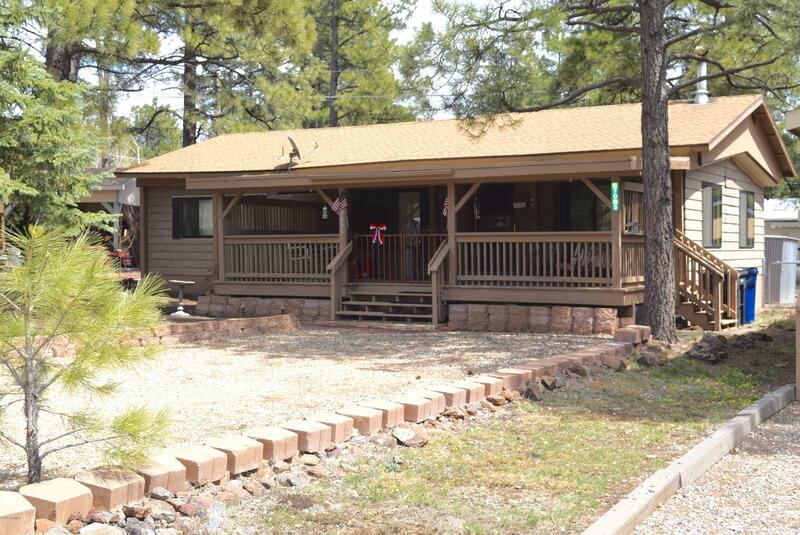 "Public Remarks: ''Welcome to a move-in ready 3 bedroom, 2 1/2 bathroom log-sided cabin in the cool pines. The living space sports a stone fireplace with long, vibrant windows opening to the front wood deck. The deck is spacious and presents a wonderful location for entertaining, enjoying outdoor meals and gazing at the spectacular stars in the summer night's sky. The living space adjoins a full kitchen with modern maple cabinetry. 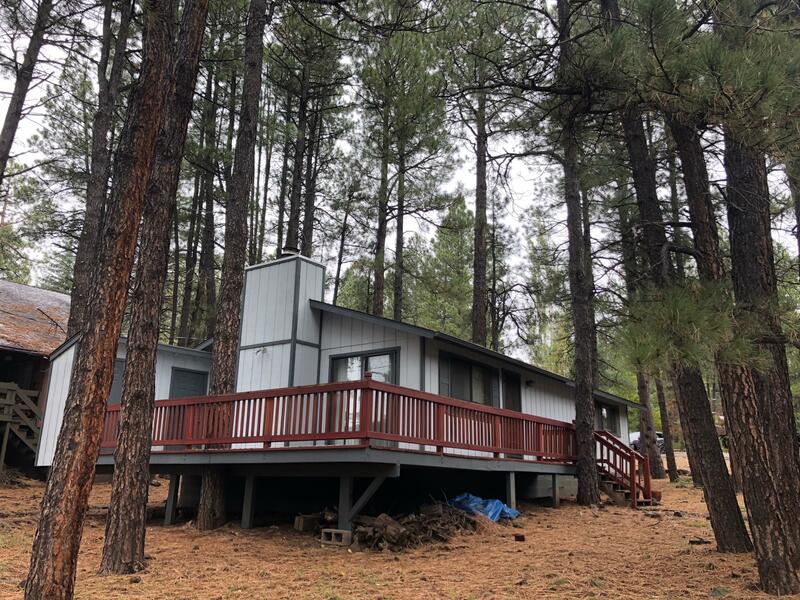 A custom pine staircase and shaved pine hand rails lead you upsta"
"Munds Park, AZ Winter Playground or Summer Hideaway it's just over an hour from Phoenix, minutes away from downtown Flagstaff, 2 miles off the highway deep in the Ponderosas. 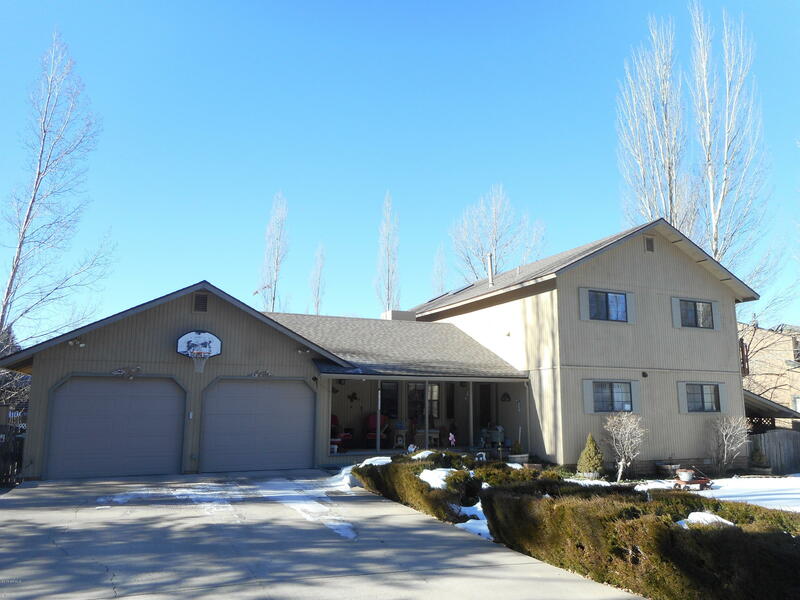 Open floor plan 2000+ SF built in 1988 3 bedrooms 2 large baths with dual sinks, wood burning fireplace, heat pump, huge 2 car garage with lots of additional parking. Fenced backyard, with dog run. 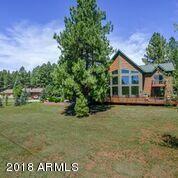 Great views of Lake O'Dell and the Red Rocks of Sedona from the large spacious Deck and Gazebo. Furnished selling as shown. 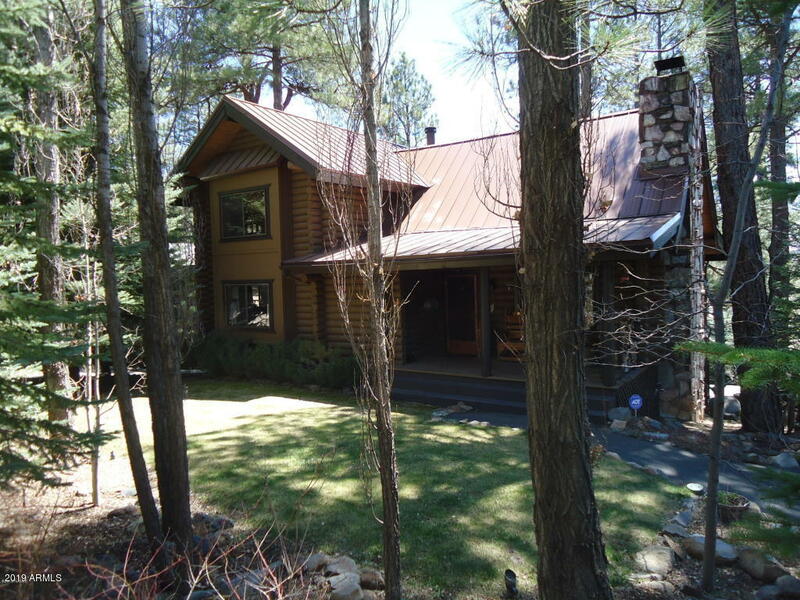 Mus"
"Absolutely stunning chalet that has just had a complete remodel. Situated on a huge (just under 10,000 square foot) lot. Walls of windows and an open floor plan. Soaring T&G ceilings. 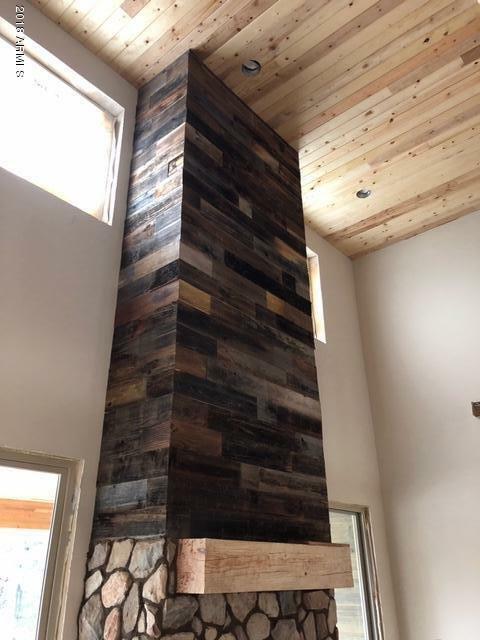 Remodeled gas fireplace. Additional dining area that opens to a covered deck. All new kitchen appliances, gorgeous granite countertops and high-end fixtures. Wood flooring on the main level and new carpet in the master, stairs and loft. Two full baths completely redone with eye-catching cabinetry and granite count"
"PRICE REDUCED!!! This is a RARE OPPORTUNITY to own a turn key home on an oversized double lot. Lovingly maintained with upgrades galore. All major appliances are new including the refrigerator, stove, microwave and washing machine as well as a new TRANE furnace. New bathroom vanity and sink with a granite countertop and nickel faucet. Forced air heat throughout as well as an electric fireplace for both heat and ambiance. Upstairs is a second bedroom suite with an attached bath. Sliding barn door"
"Adorable, single level cabin on a gorgeous 25,150 sq. ft. lot. Amenities include 3 bedrooms, 1.75 baths (3rd bedroom is open to the living area and is being used as an office. Fireplace, propane gas heat, and air conditioning. Detached, 2 car garage , storage shed & wheel chair ramp leading to the side entrance. Circular drive, room for an RV & your toys. 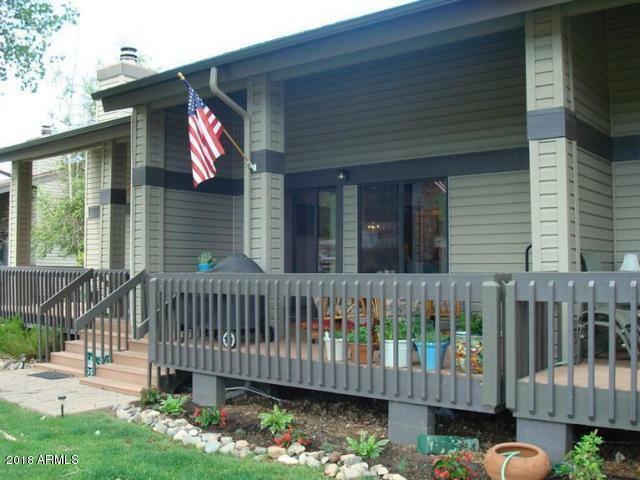 Relax and enjoy the beautiful area sitting on the front covered porch." 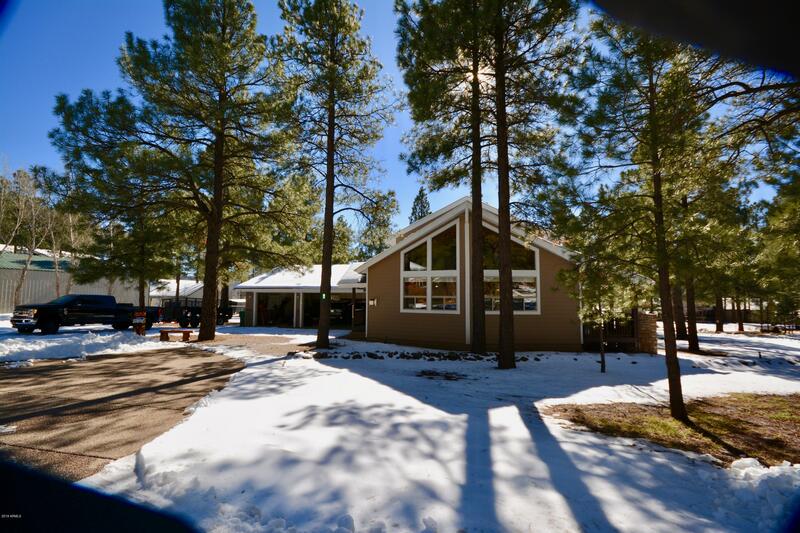 "Newly remodeled one level home on beautiful treed lot. Large 2 car garage. All new flooring and appliances." "Fabulous Year Round Home with 3 BR; 1.5 BA in the cool pines of Munds Park! ; It has a newer roof 2017 on Shed, Garage and on Home, surveyed and fenced yard, Newer deck skirting, back deck lattice and door, Kitchen offers New Sink, faucet, Disposal, Upgraded Stainless appliances, Dishwasher, convection stove, Newly Finished Neutral Counters; plenty of Cabinets! Master Suite is downstairs with half bath. Full Bath down as well. LR walls & Ceiling just painted & new GFI switches & outlets making"
"Amazing mountain property in coveted Munds Park! 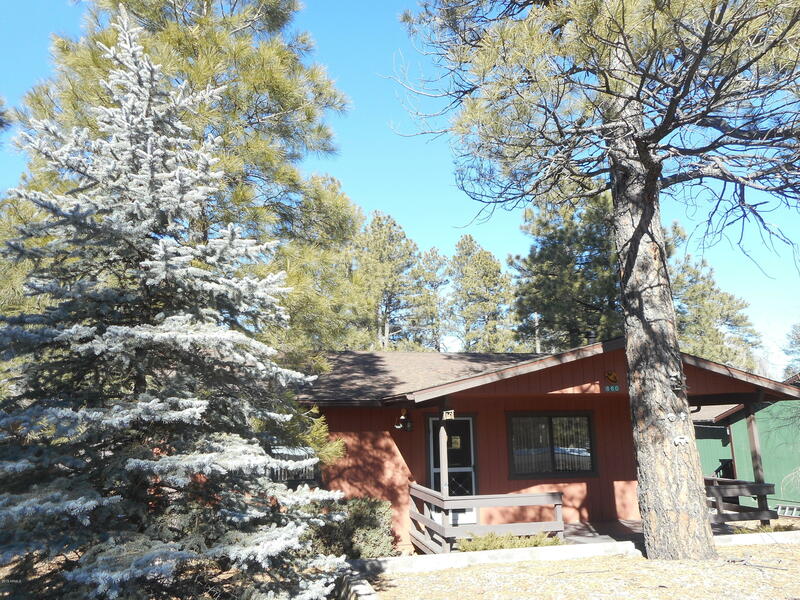 Situated on a large TREED lot with plenty of space between neighbors and almost unobstructed views. Huge wrap around deck with large trees off the deck, Step inside to an open concept floor plan centered by a charming fireplace, just enjoy those COOL nights! Large open kitchen with breakfast bar and vaulted ceilings. 2 large bedrooms and 2 full baths with updated shower/bath surrounds. Wall heaters in every room for individual comfort, great views"
"UPDATED TOWNHOUSE LOCATED ON THE #10 FAIRWAY OF THE PINEWOOD COUNTRY CLUB GOLF COURSE. 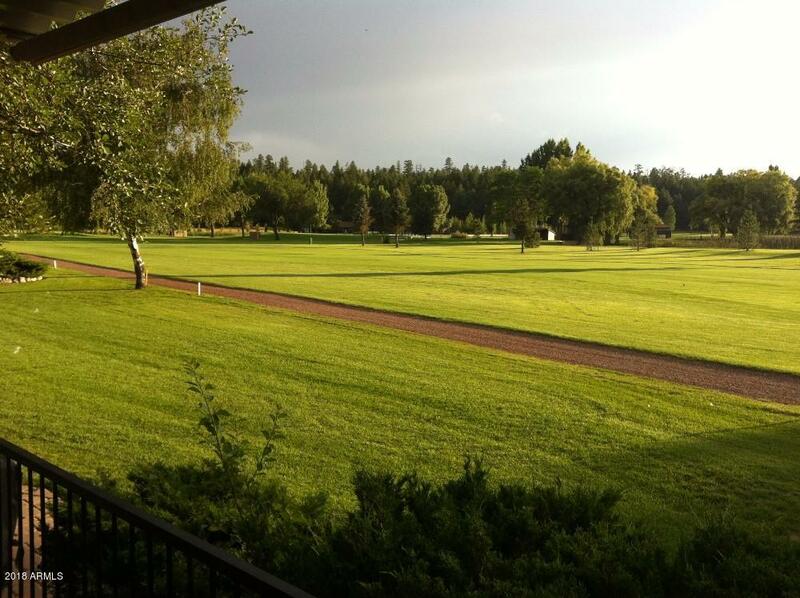 BEAUTIFUL PANORAMIC VIEWS OF THE LUSH GREEN GRASS AND PINE TREES. LARGE MATURE TREES SHADE LARGE PATIO. RARE END UNIT WITH VIEWS FROM FRONT AND BACK PATIOS INCLUDING GREENBELT. BRAND NEW NEVER USED DISHWASHER, 2 BRAND NEW ENERGY EFFICIENT WALL HEATERS, LARGE MASTER SUITE BEDROOMS WITH AN EXTRA LARGE LOFT WITH WALK-IN CLOSET. NEW FLOORING, PAINT THROUGHOUT. UPDATED KITCHEN WITH GRANITE AND APPLIANCES, WINE REFR"
"UPDATED TOWNHOUSE LOCATED WITHIN WALKING DISTANCE TO THE PINEWOOD COUNTRY CLUB GOLF COURSE. NEW WALL HEATERS, LARGE MASTER SUITE BEDROOMS WITH AN EXTRA LARGE LOFT WITH WALK-IN CLOSET. NEWER FLOORING, PAINT THROUGHOUT. NEW TOILETS, UPDATED KITCHEN WITH GRANITE AND STAINLESS APPLIANCES, CABIN FEEL THROUGHOUT WITH NEWER FIXTURES AND ACCESSORIES. THIS TOWNHOUSE HAS BEEN WELL MAINTAINED AND IS LIGHT AND BRIGHT. A BEAUTIFUL SHORT 2 HOUR DRIVE FROM PHX TO GET OUT OF THE HEAT! 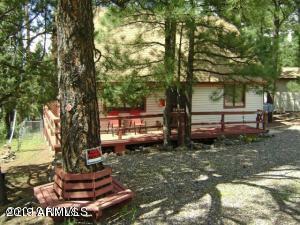 COME SEE YOUR NEW PLACE "
"Situated on an oversized lot, nestled in the trees and just a quick walk to the forest. Larger doublewide with an open great room concept. Oversized living area, dining area and a sunny bonus room all surround the kitchen. A spacious covered front deck spans the length of the home. Plenty of parking and still enough room for an RV. Fenced in back yard and an oversized lot!"